Discussion in 'Baptism' started by C. M. Sheffield, Apr 15, 2019. Obviously. But his comment here concerns the mode of baptism, not its subjects. Yes, but you would deem it necessary correct? P.S. Thanks for sharing the quote BTW. I'd read somewhere that it was a practice to immerse babies. And that it led in some cases to the deaths of those babies (because of the cold climate in northern European countries). Dunking of babies is still practiced in many Eastern Orthodox churches. It's free to gawk at it on YouTube. Yes, it's interesting coming from an arch-enemy of the Anabaptists. But Luther does here expressly say that whatever his preferred mode, it is not a necessary thing. It's a far cry from what Anabaptists and many Baptists have taught about mode. Just watched two. The first the "priest" seemed a bit of a hippy and it was at least gentle. Then watched one in a church and the guy was plunging the baby into the water like it was an enhanced interrogation?! Our Confessions states "Immersion, or dipping of the person in water, is necessary to the due administration of this ordinance" (29:4). So it necessary for proper administration, though it is not a sine qua non of baptism itself. In other words, a person baptized by affusion (upon profession of their faith) is truly baptized, even though we would say it was administered improperly. The question is one more of proper observance than of the essence of baptism. I appreciate you Christopher; thanks for the quote too. We accept all modes as proper administration, but of course prefer sprinkling and pouring. I'm sure you realize we do this because we see these forms as biblical as well; the sprinkling going back to OT purifications (Numbers 8:7 with John 3:25) and the pouring tying together Christ's words that the apostles would be baptized and that at Pentecost the Spirit was poured out on them. But as Vos explains, our main deal is never to defend sprinkling or pouring as the only proper mode. Keep the quotes coming! Luther and Calvin both admit that immersion is the plain meaning of the word "βαπτίζω" and that it was the practice of the Apostolic Church. After admitting this, they say, "But it isn't necessary." If by "necessary" one means to say that one baptized by some other mode may still be regarded as a baptized Christian, then I would agree. But if it rather means that the church is at liberty to disregard the plain meaning of the word "Baptize" (the very substance of the command itself), then of course I cannot agree. Lets for argument sake say Luther and Calvin are right and that the word means "immerse." On what grounds could anyone deem immersion as being of no consequence when their Master has explicitly commanded it? We accept all modes as proper administration, but of course prefer sprinkling and pouring. I'm sure you realize we do this because we see these forms as biblical as well; the sprinkling going back to OT purifications (Numbers 8:7 with John 3:25) and the pouring tying together Christ's words that the apostles would be baptized and that at Pentecost the Spirit was poured out on them. But as Vos explains, our main deal is never to defend sprinkling or pouring as the only proper mode. Luther here says the word baptize means immerse. Calvin says "It is evident that the term ‘baptize’ means to immerse, and that this was the form used by the primitive Church." (Institutes, IV.15.19). My contention is simple: If the word means immerse—as it certainly does—then in his institution of baptism, Christ has commanded his ministers to immerse. Even if the points about the imagery of pouring be admitted, it does not change the fact that when Christ instituted the sacrament, he did not command his ministers to sprinkle or pour. He commanded them to "immerse." On what basis can we say, doing what Christ commands is "unnecessary"? When I first joined PB, I found the below thread very helpful with regards to the question of immersion. Does it mean immersion in Hebrews 9:10? Also, how were the apostles baptized with the Spirit? By immersion or was it poured out? Christ spoke of that event as the baptism of the Spirit, did he not? "But you will be baptized with the Spirit not many days from now." With all respect, this doesnt mean immersed in this context (Acts 2:16-18). But I could be missing something. If so please help me understand how Acts 2:16-18 was immersion? Calvin also said we should baptize covenant children, are you with him on that one? Calvin is not the authority on baptism. Everyone likes to quote Luther and Calvin when it suits them (I have done this too), but they weren't infallible. If the word only means immerse, then of course, we must "immerse", but that is a moot point because it does not necessarily mean to immerse. If it did, the translators would have simply translated the word "immerse" would they not? However, they did not translate it. They transliterated it. Look up every translation - I don't know of a single one that translates the various greek words for baptism as "immerse". And if they do, it certainly is not universal. Why? Because it is not a technical word, it has many different usages and it does not always mean the same thing. In the Bible you have the people baptizing their couches (Mark 7). What did they do, rent a crane? In Hebrews you have the author referencing various "washings", literally various "baptisms" of the OT, or "cleansing rites" (Hebrews 6:2). My understanding is that these were done by sprinkling. Furthermore, there are other usages in the Bible that do not really follow the logic of immersion - see: the outpouring of the Holy Spirit at Pentecost. The people were not immersed into the Holy Spirit. The biblical data is clear that you simply cannot equate baptism with immersion. I would heartily recommend the book "The Meaning and Mode of Baptism" by Jay Adams. He simply looks at the scriptural data on this subject. Does it mean immersion in Hebrews 9:10? Also, how were the apostles baptized with the Spirit? By immersion or was it poured out? Christ spoke of that event as the baptism of the Spirit, did he not? "But you will be baptized with the Spirit not many days from now." With all respect, this doesn't mean immersed in this context (Acts 2:16-18). Hebrews 9:10? Why not? There were washings that required the full submersion of the thing being washed. And that is consistent with the meaning of the word used. As to Acts 2:16, the Spirit being "poured out" and "immersion" are in no way mutually exclusive. It simply means the Spirit was poured out until they were immersed/overwhelmed by Him. Two examples from God's wrath being poured out will prove the point. The wrath of God was poured out literally with rain from heaven on the generation of Noah until they were immersed in it. So it fell on them until they were overwhelmed by it. Similar language is used by our Lord regarding his suffering in a figurative sense (Mark 10:38). God's wrath was indeed poured out on the Son of Man. But there can be no doubt that it was poured out until he was immersed in/sunk under/overwhelmed by it. This perfectly suits the "pouring out of the Spirit." He was poured out on them until they were baptized/immersed in Him. What a glorious image! Kind of stretching it I think. The Spirit was poured out upon them. They did not go down to be immersed in the Spirit. Has anyone ever been immersed by water baptism in the way you are describing? That would make quite a scene. So, those are my thoughts. But don't want to argue and I definitely hold it all more loosely than justification. So we're good there . Thanks for the dialogue Christopher. The issues of subjects of baptism and modes of baptism don't need to be so connected. While today most credo-baptists practice immersion and most paedo-baptists practice sprinkling/pouring, there have always been exceptions. I don't know why so many are bringing the subjects of baptism into this discussion about mode. 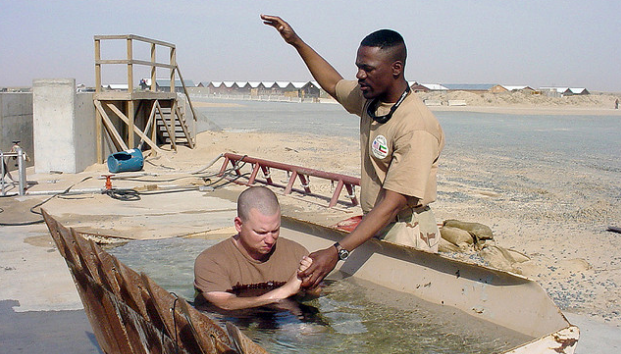 Has anyone ever been immersed by water baptism in the way you are describing? My only point was that "pouring out" and "immersion" are not mutually exclusive. Not that it's what should be done in baptism. The Spirit was poured out. But we are never commanded to pour out water on one being baptized. When Christ instituted the ordinance, he commanded they be "immersed." The fact that the Spirit was "poured out" doesn't mean we can dispense with immersion in baptism. No one is forcing you to participate. If you don't like the discussion, find another one to join. I'm enjoying the exchange. Do you also believe Luther in saying that baptism is a washing away of sins? Rather than a symbol that one's sins have already been washed away? There is a difference. Baptismal regeneration is unbiblical, and a far bigger issue in Luther's theology than his mode of baptism. Brother, I believe you quoted Luther saying the word baptize means immerse. I'm just giving you one example where it doesn't mean immerse, but rather poured out. I'm enjoying the exchange too. I'm just giving you one example where it doesn't mean immerse, but rather poured out. Acts 2:16-18 never uses the word baptize. So that is not an example of the word meaning something other than immerse. You are equating the figurative language of "pouring out" with baptism and then insisting that that is what baptism means. But as I've already demonstrated, pouring out and immersion are two different aspects of the Spirit being given at Pentecost. The rain is poured out from heaven until all but eight are immersed in God's wrath. "Poured out" speaks to the source of this judgment (i.e. the God of heaven), immersion is its extent and effect. In like manner, the Baptism of the Spirit is poured out from the God of Heaven until its subjects are immersed in him. "Poured out" speaks to its source, while "baptize" speaks to its extent and effect. But in calling it "The baptism of the Spirit" the emphasis is placed not so much on the source (poured out from heaven) as its extent and effect (we become wholly immersed in the Spirit of God). Of course I don't subscribe to baptismal regeneration. My interest in Luther's comments related to what he says about the mode. I am paedo, but we obviously baptize converts. There are so many situations when immersion baptism is impossible that it seems counterproductive to put so much emphasis upon it rendering those who can't be baptized in that manner to feel as though they are not "properly" baptized. One of many examples where "dipping" isn't possible is most military battlefield conversions where often only a few drops of H2O out of canteen can be afforded. Obviously there are unique circumstances which would make immersion very difficult if not impossible. But those situations are very few in number and do not justify dispensing with the biblical mandate. 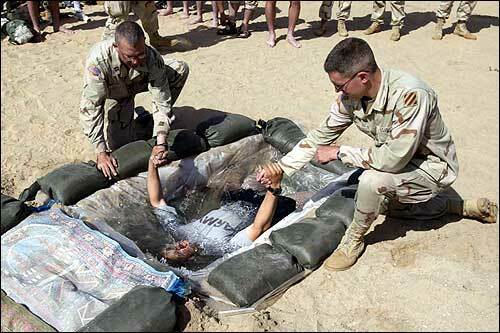 And as a veteran, I can tell you, battlefield baptisms by immersion are not impossible or even uncommon. To be clear, I have performed a baptism of a man who was an invalid. Before he died, he professed faith in Christ and expressed a desire to be baptized. I had no clue how we could do it. But eventually, we arranged for an ambulance to bring him to church. He was brought in on a stretcher and rolled to the front of the church. I baptized him by pouring a pitcher of water over his head. So I understand their are sometimes circumstances that make immersion impossible. But I am convinced, that where it can be performed, immersion ought to be observed in obedience to Christ. Why did you misinterpret my comment? I was not exaggerating when I said often only a few drops of H2O from a canteen can be afforded for baptism on the battlefield. Your photos do not depict combat conversions on the battlefield. There are so many circumstances when immersion baptism is impossible. Therefore, in those many impossible circumstances then newly baptized converts should not have doubts about the authenticity and validity of their baptism when it could not be achieved through immersion.